Some great games to report on again this week with our Firsts, Seconds, U16’s, U12’s, U10’s and U9’s all in action. Following on from the success of our last event a few weeks ago we are hosting another Pimms and Prosecco event on the Green from 5:30 to late this Sat 8 July for all wives/girlfriends and ladies associated with the club. All male members and supporters of the club are also very welcome. Nick Payne has very kindly donated the Prosecco again and we will be having a BBQ along with some Thai curry supplied by the Three Crowns. Why not come down a little earlier to watch our firsts play against Broadbridge Heath in a 40 over win/lose format game and spend the evening with us. 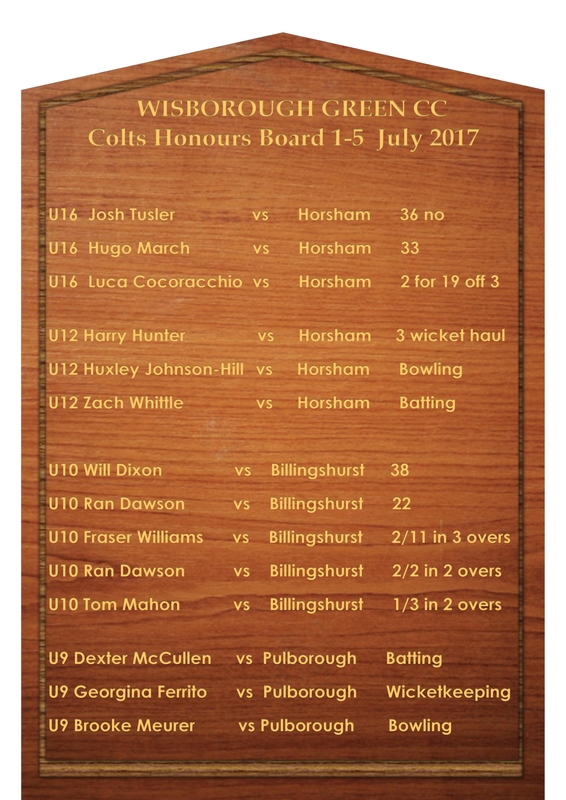 Last week we highlighted some of our Colts who are representing the county this season. Included in the list is rising star Eddie Ragg, pictured below. Have you missed a previous edition of Wizzy news ? Don’t despair – all the Wizzy News editions for this year are now available on our website. Click on the ‘newsletters’ link at the bottom of the home page and click on the relevant link – or click here to go straight there. There are a number of clubs who share the facilities on the Green and we all need to be mindful of each other’s use of the Green and the Pav. There have been a number of incidents recently where the kitchen and storeroom have been left in a rather untidy state which had to be sorted out by the next group using the facilities. It would be great if we could try and leave things as we found them – or in an even a better state. We all like turning up to clean and tidy facilities which sets a positive tone for the sport we all enjoy on the Green. – Top contributions from Steyn (44), Napper (43) Colbran (37) and Sadler (37). – Nappers long throw completes one of the slowest run outs ever seen. Captain Hugo March completes all round performance with valuable 33 run knock. The sun was shining and Wisborough looked beautiful, but unfortunately we were playing at Broadbridge Heath. We arrived at 11:45 and the place was locked up…….so we waited and waited and eventually at 12:15 someone came to open the Pavilion. The wicket looked very 2 paced with tufts of grass growing in strange directions. The toss was unfortunately lost and Broadbridge Heath captain had no hesitation in putting us into bat. Benjamin Steyn and Tim Dodd opened the batting and it wasn’t long before the two were smashing the bowlers around the ground. 50 was up in 6 overs and the 2 looked very comfortable. Benjamin then had a rush of blood and tried to pull a short ball that kept low and was bowled for 44 in over number 8. (If only he could have batted 15-20 overs). Byron Napper came to the crease, and looked solid, with Dodd carrying on the offensive. Dodd perishing for a well made 33. Sadler joined Napper at 83 for 2 and together they started to build towards a total, putting on 83 before Sadler hit a drive to mid off for 37. Napper continued building with George Magnus. Napper went for 41, and Magnus soon after for 6. Jamie Self and Joel Colbran then batted well to move the score towards 200+ with Colbran hitting some great 6’s and Self playing a valuable cameo. Self went for 10, and Ben Thatcher stroked the ball around with Colbran smashing a quick fire 37. Jack Sizzey Carter then hit a boundary to allow Wisborough to declare an over early on 248 for 8. Broadbridge Heath then came out to bat all guns blazing with Jordan Ruff hitting the ball well. Broadbridge Heath lost wickets at regular intervals and despite ridiculously attacking fields decided to block for a draw from around 15 overs to go. The wickets were spread out between most of the bowlers but Jack Sizzey Carter and Ben Thatcher taking 2 a piece. Some good contributions for the other bowlers but we could not get the last 2 wickets and had to settle for a winning draw. Broad bridge Heath finishing on 151 for 8 in 46 overs. Whilst I love the traditional declaration cricket, having played in that match and on that wicket, (where we scored 248 and no one got a 50), you can see why ‘win lose’ format of 40 overs is appealing to get sides to want to win games. On the positive side, our batting again looked strong and bowlers continue to ask questions of the opposition batsmen. A youthful 2nd XI welcomed Broadbridge Heath to the green on a lovely summers afternoon. Stand in skipper Francis won the toss and elected to have a bat due to the weather and the long and exciting batting lineup at his disposal. F. Vickery and Francis opened up with Vickery holding up one end well and Francis taking advantage of the half trackers on offer at the other end, until he stuffed one down mid-wickets throat. 14-1. Drill Sargent/Vice Captain, Marina, was next in at 3. He and Vickery kept it tight initially but singles were hard to come by due to Marina’s pubic bone injury causing the big fella to be all but immobile (I’m still not sure how this injury occurred in the first instance?!). Marina decided to take things into his own hands and set about the bowling attack, smashing a quick fire 28 in boundaries before sticking one in the air. Vickery soon followed missing the straight full toss after a patient innings. 43-3. With the balance of the game slightly in the favour of the visitors, the rather more mobile pairing of Jr and DJ came to the crease. The 2 of them milked the bowling well, taking singles where available and caressing the bad ball to the boundary with ease. The pair of them batted with great intelligence and it was only a miracle direct hit run out from the boundary that sent Jr back for a well made 41. It really was a game changing 106 run partnership and it put Wizzy back in the ascendency. That was until DJ had a rush of blood to the head. Having now got his 50 and running low on fuel/Friday night’s Stella, his less than straight blade failed to connect with the straight one. A really good knock of 59. 154-5. 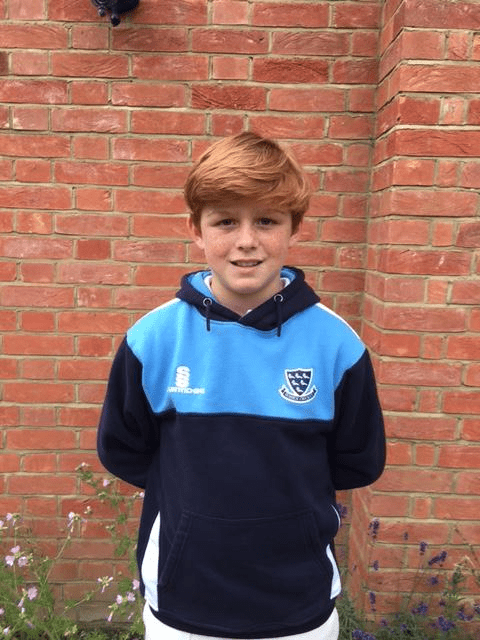 Georgie Nicholls was next in at 6 and nurdled the the ball round well whilst Jacob initially took a more aggressive approach at 7 and set about the bowling from the off, blasting the first 2 deliveries faced for 4. The 2 of them looked very comfortable and finished off the innings in style, knocking up a quick 60 run partnership, with Georgie finishing on 34* and Jacob being stumped on the last ball of the innings for 26. A commanding 211 posted in 40 overs. The usual dream tea prepared by Lena was consumed. This week’s offerings included hot dogs, pizza and ferrero rochers, Lena was certainly was spoiling us. After tea, Wizzy went to work on defending the imposing first innings total. With Jr suffering from doggers heal, Tom Jenkins was given the new ball for his first game in the 2017 campaign for the green. It was a real treat to see the strapping lad steaming in down the hill again, a much loved site of many a Wisborough Green housewife over the years. He soon removed the dangerous Matt Varghese who popped one up to DJ at short cover (definitely not a bump ball…). Tommy bowled his full allowance of 9 overs with great control, aside from the odd loose delivery that had Callum sprawling behind the stumps. The youthful Luca was chosen to open up the hill. He caused the batsmen plenty of issues too and was unlucky not to take a wicket with a number of shots being spooned in the air. Tight bowling from the 2 openers really put BBH on the back foot as the run rate soon began to rise. However, BBH still had plenty in the hutch ready and waiting so the game was still well poised after 15 overs, albeit still well in Wizzy’s favour. 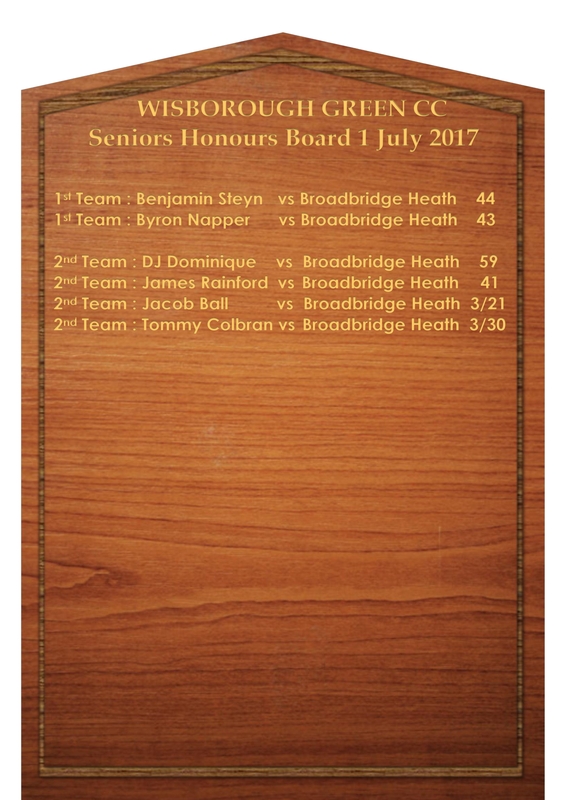 Jacob and Tommy Colbran were the next 2 to take over the bowling duties, and with Jacob probing at the right handers off stump with inswingers and Tommy turning it square, they were soon in the wickets. Tommy was first to strike with Mr Round popping one to TJ. Jacob soon struck too, getting one to swing back into the number 4’s off peg. Number 5, Xavier, was next in and he was keen to start hitting boundaries from the off. He soon put one to cow corner, after which the immobile Marina planted himself in said area having previously been at short mid on. The very next delivery saw another agricultural shot played and luckily for Marina it was perfectly placed for his bread basket, not having to move an inch to take the catch. The skipper took the plaudits but it was the Special Ops of the VC, coyly placing himself on the boundary, who ended Xavier. TC proceeded to a bowl a few more batsmen round their legs and Jacob secured another wicket with an lbw as the pair ripped the BBH batting lineup to shreds. With the young guns bowled out and ending on 3 wickets apiece, Franky got the nod and bowled a great line and length to deservedly knock a couple more wickets off leaving BBH reeling at 117-9. DJ was the only other bowler required and was unlucky not to strike with multiple deliveries all but shaving the off stump. Despite the win/lose format, the final pair decided to play for their averages and the BBH innings finally finished at 141-9 off their allotted 40 overs, giving Wizzy the W.
A really great team performance was key to 70 run win, with the middle order batting superbly and every bowler bowling with skill and control. The fielding aspect was exception too with Callum putting in another tidy shift behind the stumps (an incredible zero byes!) and despite a couple of half chances shelled the team put their bodies on the line and fielded like a dream.